Spelt flour is a type of non-wheat flour available in the market that is quite popular. Many types of wheat free recipes including pastas, breads etc are made from it. Spelt flour is prepared from spelt, which is a cereal grain belonging to the family of wheat. The cultivation of spelt is being done in Middle East and central Europe since many centuries. The appearance of spelt is very similar to wheat; however, its outer shell is much harder than wheat before milling. Due to the hard outer shell, higher amount of vitamins and minerals are present in spelt flour in comparison to wheat flour. Its flavor is quite similar to the flavor of whole wheat flour-slightly sweet and nutty. There is some amount of gluten present in spelt, the reason that makes it a popular choice and substitute to wheat flour in cookies, breads, pastas etc. By using spelt flour, you get whole wheat like taste and the quality and texture of baked product is also not compromised. There are basically two types of spelt flour that are available in the market. A large variety of nutrients of the cereal spelt is present in the whole grain spelt flour as during preparation the flour is neither bleached nor filtered out making it a rich source of nutrients. Whole grain spelt flour is also a rich source of protein and the protein content is higher than most other types of cereal grains and flours. Hence, it is a good choice for individuals or vegetarians who are on a look out for sources of non-meat protein. The amount of protein present in whole grain spelt flour is even greater that the protein present in while spelt flour. The fiber content of whole grain spelt flour is also quite high in comparison to the fiber content of white spelt flour. Dietary fiber is important for healthy functioning of the digestive system and also for maintenance of overall health; people who want to up the fiber content of their diet can include whole grain spelt flour in their diet. 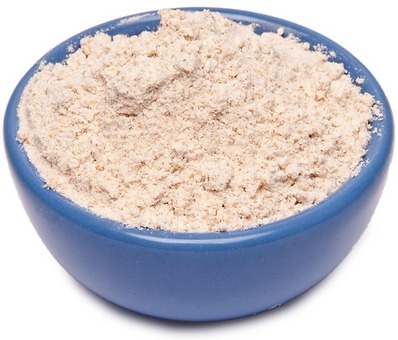 White spelt flour is formed by refining and sifting whole grain spelt flour. The germ and bran is removed from the grain in the process. There are numerous benefits and advantages of eating white spelt flour in comparison to whole grain spelt flour. White spelt flour has lower calories when compared to whole grain spelt flour. This feature is especially beneficial for those individuals who want to limit their calorie intake. In addition to this, the gluten levels of white spelt flour are lower than whole grain spelt flour. Hence, it is a boon for individuals who are allergic to gluten. Moreover, cooking and baking with white spelt flour is easier than whole grain spelt flour. Spelt flour is an excellent and appropriate alternative to wheat flour and can be used by individuals who are sensitive to gluten. The properties of spelt flour are quite similar to wheat flour as it also belongs to the family of wheat. Spelt flour is rich in nutrients and does not contain any harmful filler. The quality of gluten present in spelt flour is very fragile in comparison to the gluten present in wheat flour. Hence, it has to be used differently in cooking than wheat flour and you cannot just substitute it with wheat flour; you have to calculate and convert the appropriate ratios while using spelt flour as a substitute. For example, begin by using only ½ of the ingredients that are usually required in wheat flour recipe, because the concentration of complex carbohydrates is higher in spelt flour. As spelt and wheat are two different grains, the quantity of water required in spelt may be either more or less than what is usually used in a wheat recipe. You can look on the internet for recipes that are specifically made using spelt flour. When you are kneading spelt flour into dough, be careful to maintain appropriate consistency of the dough. As a general rule, mix only ¾th of the quantity of what you mix with wheat flour. For example, if you are adding water, add only ¾th of the amount you would normally add in wheat flour. If the dough becomes too wet and sticky, you can put more spelt flour and if the dough is too dry and not sticking, add more water or any other liquid you are using in the recipe till soft and pliable dough is formed. Locating spelt flour is not difficult and you can easily found it on the shelves of your local grocery store; check in the organic section to find it. You can also purchase spelt flour from natural food stores or bulk food stores. Take care and check that no moisture is present in the container or package. Make sure that the product you are buying is fresh and not stale. Buy only from that bulk food store that has a high turnover of products to ensure that the spelt flour you have bought is fresh. Usually spelt flour is best kept refrigerated. However, if it is to be used within a time period of few days, it can be stored in an airtight container and kept in a cool and dark place.